Nvidia co-founder and CEO Jen-Hsun Huang has declared that Android tablets will overtake Apple's iPad in 30 months. As Android for tablets improves and more apps hit the Android Market, Huang believes the platform will pass the iPad just like it did with the iPhone. "The Android phone took only two and a half years to achieve the momentum that we're talking about. I would expect the same thing on Honeycomb tablets," Huang said at the Reuters Technology Summit in New York on Monday. "As a result of so many different parties working together, the first versions tend to be a bit clumsy to roll out. However, as is the nature of these organic industries with very, very large players, you have continuous improvement at a very rapid pace. Everyone recognized the shortcomings of Honeycomb 3.0, jumped in working on Honeycomb 3.1, and if you haven't had a chance to play with it -- it's just delightful." 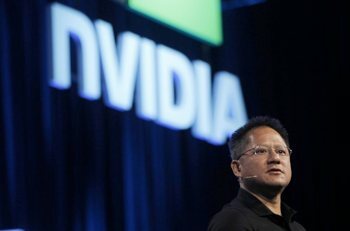 Nvidia has a vested interest in Android gaining market share. The maker of graphics chips for PCs launched its Tegra 2 processors this year, establishing itself as a major player in high-end smartphones and tablets by manufacturers like Samsung and Motorola. This is only the beginning. For example, we recently just learned that Amazon may have chosen Nvidia to power its rumored tablets. The entry-level tablet is codenamed Coyote and will be based on the dual-core Nvidia Tegra 2 platform. The second one is codenamed Hollywood and will be based on the quad-core Nvidia codename Kal-El platform (likely to be called Tegra 3). Kal-El has been sampling for the last three months and could land in products as early as August. It has already won at least 10 spots in devices (five major phone companies and five major PC manufacturers), including phones, tablets, and low-powered laptops. Google officially launched Android 3.1 (codenamed Honeycomb) last week. The minor update to Android 3.0 (codenamed Honeycomb) is being made available to various tablets in the coming weeks. In fact, it's already available for first tablet that launched with the tablet-optimized version of Android: the Motorola Xoom. While it's not clear if further Android 3.x versions are in the works, Google has already announced that the next version of Android is codenamed Ice Cream Sandwich, slated for Q4 2011. While we don't know what version number it will have, rumors have previously suggested Android 4.0. Ice Cream Sandwich will work on all devices: smartphones, tablets, TVs, and so on.